Ryan, William, Chris, Don, Brandon and Jim with catch! 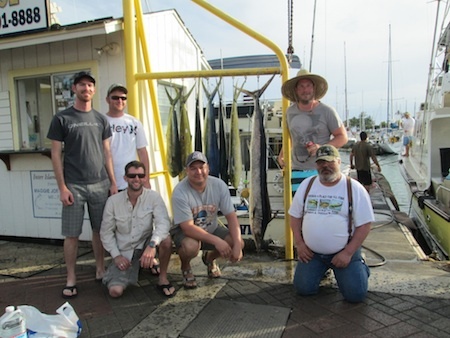 Mahalo to Ryan, William, Chris, Don, Brandon and Jim for choosing Maggie Joe Sport Fishing! The guys joined Captain Darryl aboard the Sea Hawk on a sport fishing charter. The day was action packed as they hauled in 6 Mahi Mahi and 1 Short Billed Spearfish while deep sea fishing off Honolulu, Oahu! Aloha! Ed, Zach, Rod and Harold with Captain Matt, Barracuda and 135 lb Blue Marlin! 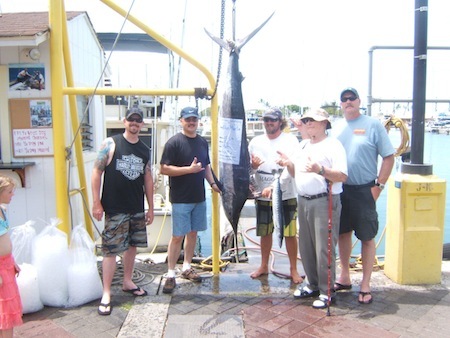 Mahalo to Ed, Zach, Rod and Harold for choosing Maggie Joe Sport Fishing! The group joined us aboard the Ruckus with Captain Matt and Mate Billy for a half day sport fishing charter. The guys departed Kewalo Basin, next to Waikiki, and spent the next four hours deep sea fishing outside of Honolulu, Oahu. Harold reeled in a Barracuda and Ed hauled in a 135 lb Blue Marlin! Way to go and Aloha! 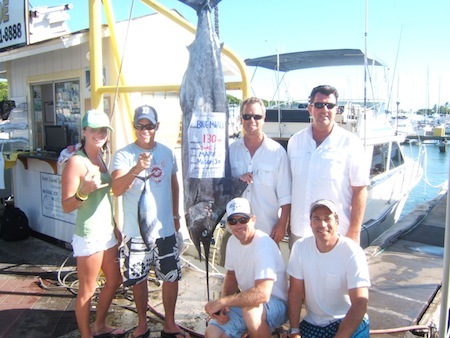 Paris, Kate, Laz, Joakim, Johim and Sinjyn with 160 lb Blue Marlin! 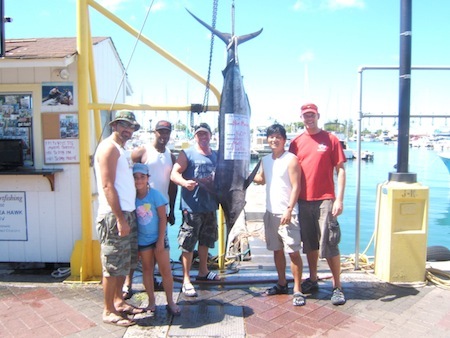 Mahalo to Paris, Kate, Laz, Joakim, Johim and Sinjyn for choosing Maggie Joe Sport Fishing! The group departed Kewalo Basin, next to Waikiki, in the early morning for a half day sport fishing charter! While deep sea fishing outside of Honolulu, Oahu aboard the Ruckus with Captain Matt they hauled in this nice 160 lb Blue Marlin! Aloha! Robert, Alan, Kimberly, Annika, Marvin, Masako and Sho with 3 Mahi Mahi! 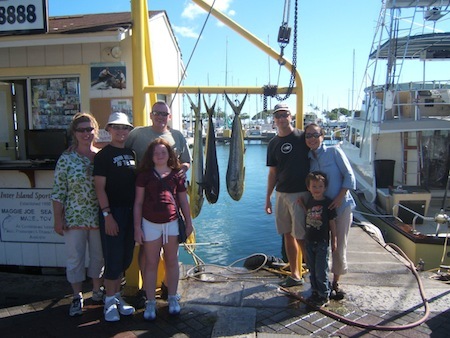 Mahalo to Robert, Alan, Kimberly, Annika, Marvin, Masako and Sho for choosing Maggie Joe Sport Fishing! The group joined Captain Mark and Mate John on a full day sport fishing charter and hauled in these 3 Mahi Mahi while deep sea fishing outside of Waikiki, Oahu! The fish were cut up and taken home for dinner! Aloha! Rich, Caitlyn, Jim, Dan, Rob and Larry with 7 Mahi Mahi! Mahalo to Rich, Caitlyn, Jim, Dan (aka Marlin Lizard), Rob and Larry for choosing Maggie Joe Sport Fishing! The group departed Kewalo Basin, next to Waikiki, in the early morning on a full day sport fishing charter aboard the Sea Hawk. While deep sea fishing outside of Honolulu, Oahu Captain Morgan found a pile of Mahi Mahi and the excitement and fun began. 7 Mahi Mahi later, the group returned and were able to have Captain Morgan and crew filet some fish to take home. Aloha! Shawn, Craig, Scott, Mark, Steven and Nicky with 130 lb Blue Marlin! 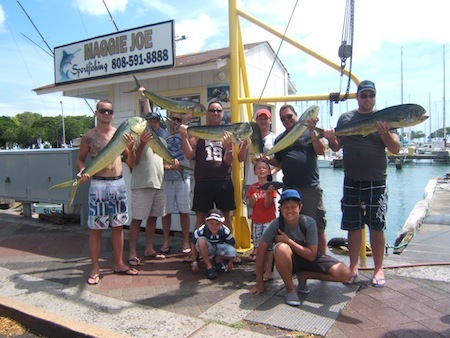 Mahalo to Shawn, Craig, Scott, Mark, Steven and Nicky for choosing Maggie Joe Sport Fishing! 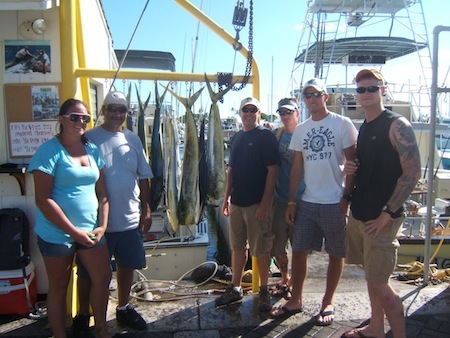 The group joined Captain Mark and Mate John aboard the Maggie Joe for a full day sport fishing charter. While deep sea fishing outside of Honolulu, Oahu they hooked up with this nice 130 lb Blue Marlin! Aloha! Nick, Kevin, Ivo, Jon, Eric and Vince with 100 lb Ahi, 30 lb Shibi an Mahi Mahi! 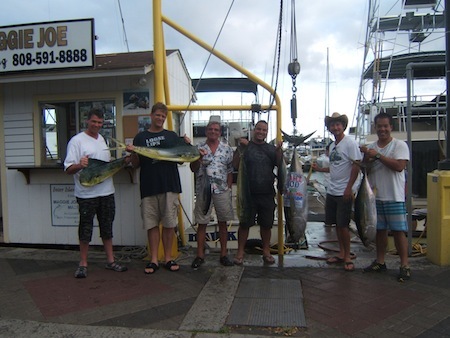 Mahalo to Nick, Kevin, Ivo, Jon, Eric and Vince for choosing Maggie Joe Sport Fishing! The guys went on a full day sport fishing charter aboard the Sea Hawk with Captain Morgan and Mate Rob. While deep sea fishing outside of Honolulu, Oahu they managed to find some pretty good eating fish! A 100 lb Ahi, 30 lb Ahi and Mahi Mahi make for a really full belly! Aloha! Chase, Daryl, Bradley, Greg, Lucas, Will, Jordan, Hans, Dalee and Daniel with 7 Mahi Mahi! 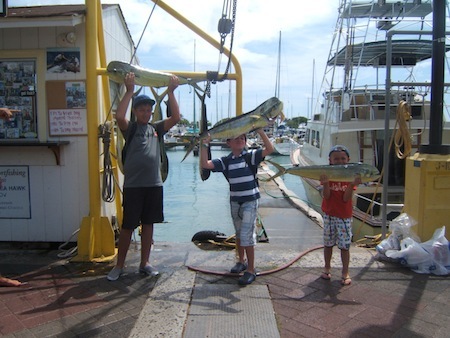 Dalee, Jordan and Lucas with Mahi Mahi! 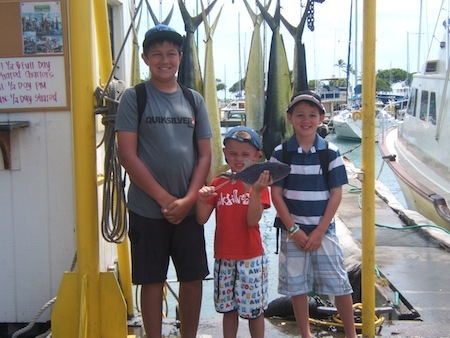 Mahalo to Chase, Daryl, Bradley, Greg, Lucas, Will, Jordan, Hans, Dalee and Daniel for choosing Maggie Joe Sport Fishing! The guys departed Kewalo Basin, next to Waikiki, on a full day sport fishing charter aboard the Maggie Joe with Captain Mike and Mate’s John and Mark. 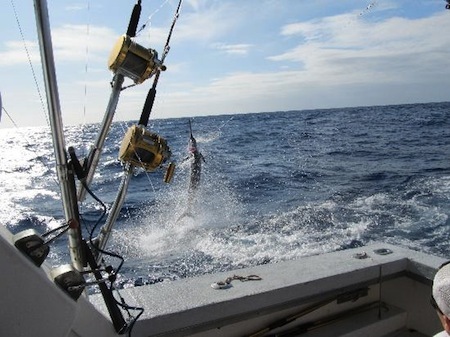 The action was fast and furious as the Mahi Mahi were biting while they were deep sea fishing outside of Honolulu, Oahu! Can’t wait to see you guys again on the water… Aloha! Griffin's Blue Marlin jumping off Maggie Joe back deck! Great photo posted on our tripadvisor page…. Griffin caught this Blue Marlin while deep sea fishing outside of Honolulu, Oahu aboard the Maggie Joe. The photo was taken as the fish was jumping right off the back deck. This is why we fish! Posted in Deep Sea Fishing, Gallery, News | Comments Off on Griffin’s Blue Marlin! Biff, Ann, RJ and Andrew with 12 lb Shibi! 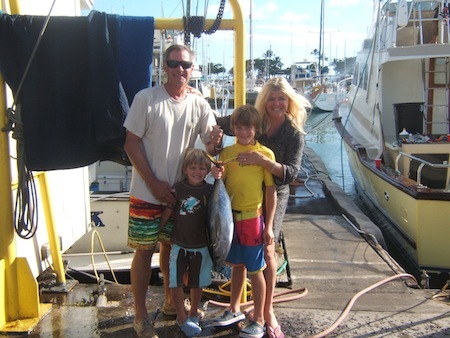 Mahalo to Biff, Ann, RJ and Andrew for choosing Maggie Joe Sport Fishing! The family departed Kewalo Basin, next to Waikiki, on a full day sport fishing charter aboard the Ruckus with Captain Matt and Mate Mikey. While deep sea fishing outside of Honolulu, Oahu RJ hooked up with and reeled in this 12 lb Shibi! Upon returning to the harbor, the fish was filleted and taken home…. nothing better than fresh Ahi sashimi!